The National Iranian American Council stepped up in defense of the Iranian regime by attacking U.S. Secretary of State Mike Pompeo’s recent speech in Cairo but failed to recognize the decision by the Iranian regime to launch “preliminary activities for designing” uranium fuel with a purity of 20 percent in violation of the 2015 nuclear deal the Iran lobby group championed. The juxtaposition between the NIAC’s criticisms of Pompeo, but failure to chastise the Iranian regime demonstrates the rank hypocrisy the NIAC operates under when it comes to picking and choosing what to criticize. In Pompeo’s speech and in follow up visits to regional allies, Pompeo hammered hard on the point that Iranian extremism and expansionism needed to be restrained by the U.S. and its allies and required a more global approach to stifle the mullahs’ ambitions. In a stop at Doha in Qatar as part of his nine-country Middle East tour, Pompeo signed a memorandum of understanding expanding the U.S. military base there and renewed efforts to form a tighter coalition with eight Arab states to generate greater pressure on Iran. Pompeo, who held strategic talks with Qatari leaders, also said reunifying the Gulf states was essential to the success of the new regional body the U.S. hopes to create called the Middle East Strategic Alliance, which would include all six GCC nations in addition to Jordan and Egypt. The Trump administration hopes the new organization will become a bulwark against The Iranian regime. 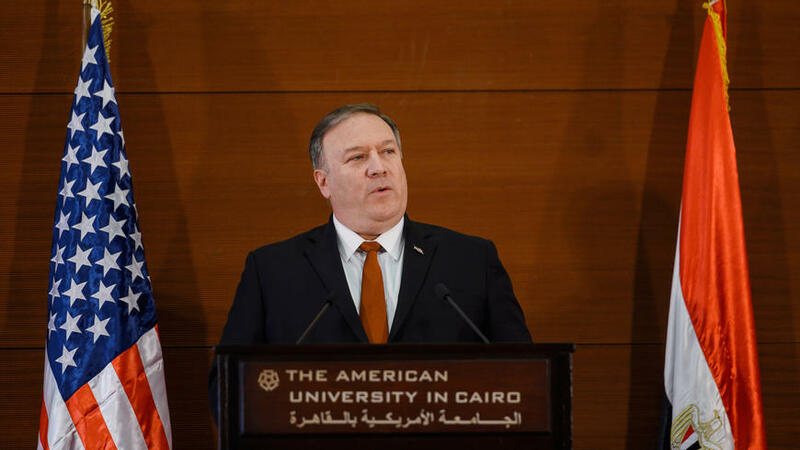 Earlier, Pompeo had given a speech at American University in Cairo – the same site as President Obama’s speech launching a new relationship with the Muslim world – where he cast the Iranian regime as the top U.S. concern in the region. “The nations of the Middle East will never enjoy security, achieve economic stability, or advance the dreams of their people if Iran’s revolutionary regime persists on its current course,” he said. The location was meant to recognize the failure of the previous administration of trying to achieve peace by coddling the mullahs in Tehran only emboldening them to plunge Syria and Yemen into bloody civil wars and launch a crash ballistic missile program. The laundry list of failures since that ill-fated speech in Cairo by President Obama serves as a reminder once again throughout history that policies of appeasement aimed at totalitarian regimes yields no moderation and little peace. Typically, the NIAC responded to Pompeo’s speech with its usual bluster but did little to recognize why its previous calls to accommodate the Iranian regime only yielded failure. “Secretary Pompeo’s speech failed to outline a coherent strategic logic for the Trump administration’s Middle East policy. If Secretary Pompeo wants regional stability, human rights, and an end to U.S. military adventures and endless wars, he would press his boss to return to the Iran deal, pursue and facilitate good-faith diplomacy among all stakeholders, and honor our international agreements,” said Jamal Abdi, NIAC president. Abdi went on to press his call for saving the nuclear deal, but even the Iranian regime seems to recognize that idea is dead as Iran’s nuclear chief announced the regime would start work on designing nuclear reactor fuel delivering 20 percent purity according to Reuters. The 2015 nuclear accord capped the level to which Iran is able to enrich uranium to 3.67 percent purity, well below the 20 percent it was reaching before the deal, and the roughly 90 percent that is weapons-grade. Iran is, however, allowed to produce nuclear fuel under strict conditions that need to be approved by a working group set up by the signatories to the deal. Those conditions include ensuring that the fuel cannot be converted to uranium hexafluoride, the feedstock for centrifuges that enrich uranium. “We have made such progress in nuclear science and industry that, instead of reverse-engineering and the use of designs by others, we can design new fuel ourselves,” state broadcaster IRIB quoted Ali Akbar Salehi, head of the Atomic Energy Organization of Iran, as saying. The move to design an indigenous nuclear reactor underscores the regime’s long-term goals to develop its own nuclear capability rather than be dependent on foreign suppliers; similar to its push into ballistic missiles by first licensing designs from North Korea and then advancing designs to carry larger warheads over intercontinental distances. The fact the NIAC made no statement about this latest move by Iran underscores its reluctance to deal with the harsh realities of Iranian intransigence as the mullahs continue their nuclear program and military efforts; now in the open and without pretense. Even as Iran steps up its nuclear ambitions and threatens to renew a regional arms race for nuclear weapons, the NIAC blasted John Bolton, U.S. National Security Advisor, for requesting contingency plans for taking military action against the Iranian regime should the pressure of renewed economic sanctions fail to change the regime’s behaviour. The planning is prudent considering the Iranian regime has already thrown Syria, Iraq and Yemen into turmoil and has sent its own Revolutionary Guard Corps to fight in Syria’s bloody civil war and Iraq sectarian conflict. But Abdi wasted no time in trying to redirect and blame Bolton for war mongering. “John Bolton and fellow Iran hawks believe they have two years left to collapse the Iran nuclear deal and trigger a disastrous war that the American people want no part of. We know that Bolton and other administration officials preferred an Iran war to negotiations prior to serving Trump. Now there is confirmation that they are still seeking out opportunities to fulfill their war agenda,” Abdi said. Of course, Abdi neglected to mention that the only nation waging war against a neighboring nation was Iran under the mullahs as its used proxies to destabilize Yemen and launched attacks on Saudi Arabia with Iranian-supplied weapons, but that is something the NIAC doesn’t want to talk about.